Utilising designs that were submitted at the competitive tender stage, Saracen has carried out the corporate finance house fit out, following an earlier redesign project which was completed by Clearwater’s workplace consultant. Work commenced in March. 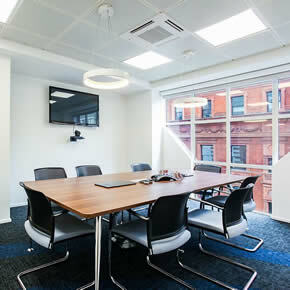 Saracen reconfigured the meeting rooms, creating a circular space in the centre of the office, which was manufactured from curved glass partitions. 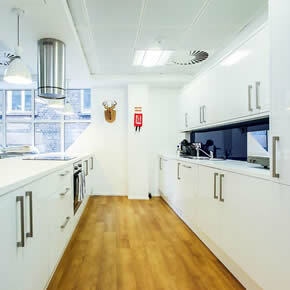 It also installed new floors, ceilings and an air conditioning system; an open plan kitchen and breakout area was designed and fitted for the benefit of Clearwater’s employees. The office is now able to make better use of space: Saracen has ensured that the company has the room to grow further within the existing building. Saracen boasts an impressive portfolio of projects in the finance sector. After improving Clearwater’s client-facing area, it has been able to add the company to its roster of regular patrons. The firm has worked on a wealth of London-based projects, from commercial fit outs to multi-million developments. It has also landed facilities management contracts and worked on office moves. Recent clients include: Coca Cola, Aspect Property Group, Pizza Hut and Toshiba.